Yesterday, amid a gala of rustling silk and stylish hats at the christening of Prince Louis, stood a rosy-cheeked nightclub entrepreneur taking his place as a godfather alongside proud grandparents Prince Charles and the Duchess of Cornwall. One is tempted to wonder what special qualities of Guy Pelly merit his being granted such an honour. Was it for organising William's stag night, or might it have been for when, stripped to his boxers, he shimmied 40ft up a marquee during a Prince's Trust concert? Perhaps it was for his brush with authority for trying to break into Westonbirt Girls School in Gloucestershire, where, he reportedly said, he was 'looking for totty.' He has also twice been found guilty of drink-driving. Yet now no one surely can doubt the intensity of the unshakeable bond between Prince William and his court jester pal, Guy Pelly. 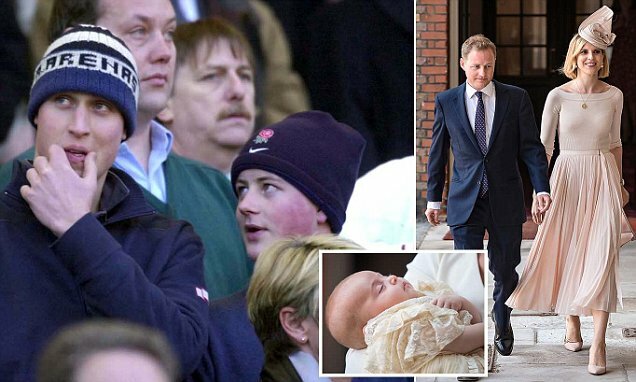 By including him as a godfather to his 11-week-old son, William has demonstrated not only their steadfast friendship but also a willingness to let bygones be bygones. Pelly was a man, remember, who had tested every sinew of royal patience and whose weakness for high jinks had so often landed William and his brother Harry in hot water that courtiers spoke wistfully — if jokingly — of the days when troublesome figures could be banished from the kingdom. When, infamously, Harry was photographed wearing a Nazi uniform to a private fancy dress party, fun-loving Pelly was at his side dressed as the Queen, whom he apparently mimicked to great effect. His raunchy clubs have, over time, been havens for Harry, certainly in the years before his marriage, and where he could always be certain the roped-off VIP room would be a sanctuary from camera-toting regulars.